Soup Run Reports Archives - Philoxenia, Inc. 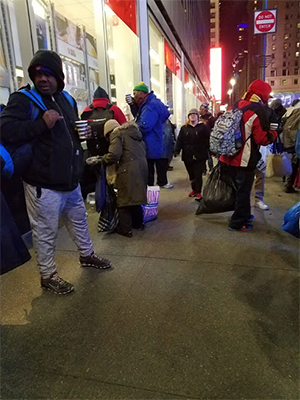 Hot meals, clothing, shoes and toiletries were distributed in record time to the more than 100 guests we served on 33rd Street in Manhattan during last night’s soup run. We arrived at our location to be greeted by a long line of people who had been patiently waiting for us for nearly an hour. Lemon chicken, rice and vegetables along with snacks, fruit, coffee and the ever-popular hot chocolate with whipped cream were on the menu. 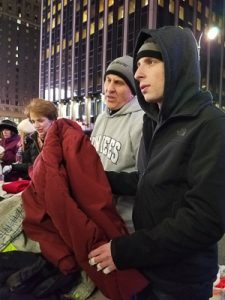 Our bins were overflowing with coats and other clothing and it seemed as if it took only 30 minutes to give away all that we had. 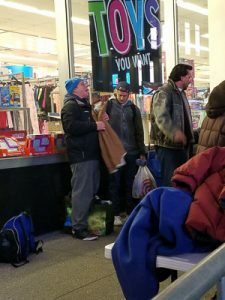 Volunteers also provided underwear, socks and several bins of men’s shoes and sneakers – every single item was accepted with sincere appreciation. The evening was lively and busy, with many volunteers giving out food, listening to and talking with our guests. We were particularly touched by Collette, an elderly woman from Brooklyn. She was introduced to us by a formerly homeless guest who now serves with us every month. Collette quietly told us that she has an apartment but has no furniture and has been sleeping on the floor for months. She asked if we have any furniture, particularly a bed, that we could give her. We promised to bring her an air mattress, pillow and linens next month. 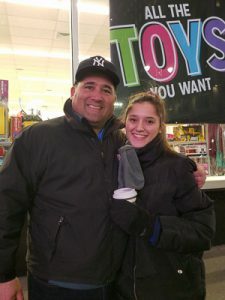 Asking Collette to hang in there and sleep on the floor for another month was a difficult conversation but she is appreciative and happy to know that we will be there for her next month. 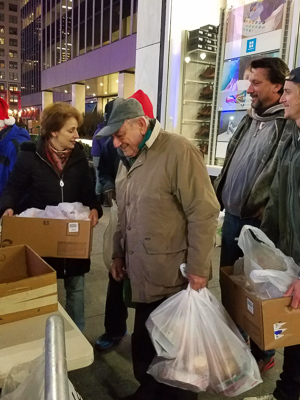 As our monthly outreach continues to grow, we were honored to be joined last night by Philoptochos members from The Annunciation Greek Orthodox Church (NYC), parishioners from St. George Greek Orthodox Church (NYC) and business colleagues of our volunteers. 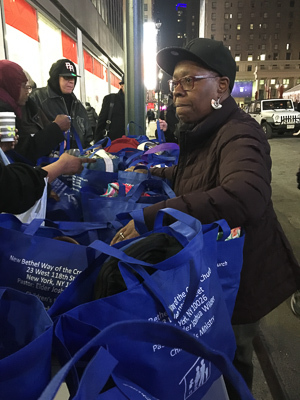 A special group of parishioners and the minister of New Bethel Way of the Cross Church (Harlem) brought numerous purses and backpacks filled with toiletry items earmarked specifically for our women guests. The generously filled bags were assembled during the church’s “Purses for a Purpose” drive and they were so very much appreciated by the women. Please join us next month on April 18th (schedule change due to Easter). All are welcome and donations of seasonal clothing, tote bags, socks and underwear are appreciated. 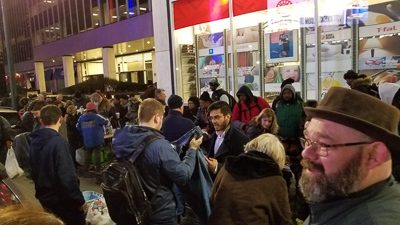 We served pasta and gave out clothing and toiletries to a large group of cold and hungry souls who had gathered on 33rd Street in New York City during last night’s soup run. 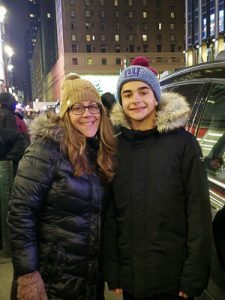 Our large group of volunteers included teenagers and those who traveled from Westchester, Long Island and Connecticut and others from Manhattan. We distributed toiletry kits, nearly 50 backpacks, tote bags, coats, sweaters, hats, underwear and socks. The backpacks and tote bags are among the most needed items and we never seem to have enough. As we were leaving, a man approached and asked us if we had any food. Unfortunately, we had given out all meals but one of our volunteers had a bag of snacks and water in her car that she gave to him. 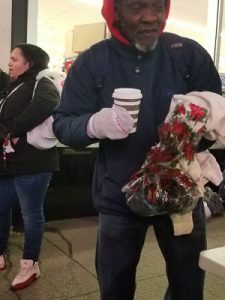 Another volunteer gave a guest his own gloves, saying that he needed them more. 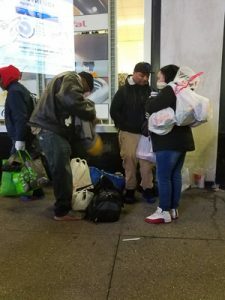 Our monthly Soup Run is a special and much-needed outreach to those who are living on the streets or eking out a marginal existence. We are thankful for the dedicated community of volunteers and supporters who give from their hearts. All are welcome to join the monthly Soup Run. In-kind donations, including coats, warm clothing, hoodies and backpacks, as well as financial donations, are very much appreciated. Please join us on March 28. 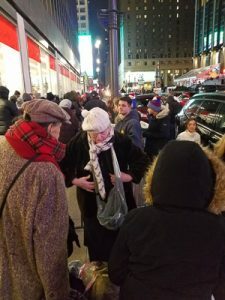 During last night’s soup run, we served 125 complete meals – turkey, mashed potatoes, vegetables, rolls, snacks and juice – to our guests in New York City who were waiting for us when our caravan of cars filled with 22 volunteers and an abundance of cold weather gear arrived on 33rd Street. We connected with guests we serve regularly, met new people and missed those we have come to know over the years – wondering where they were. 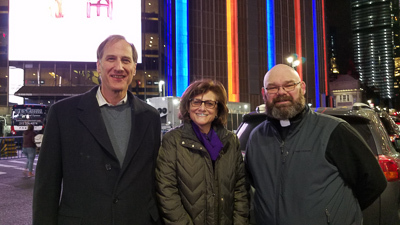 Much gratitude was expressed from so many, including the couple with five children ages 7-17. They were overwhelmed with appreciation when we gave them enough meals, hats, scarves and gloves for their children. 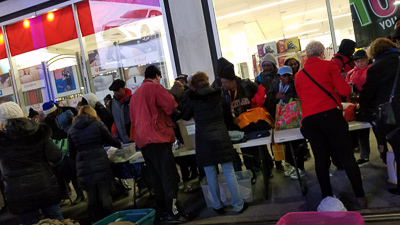 With about 20 meals remaining, we went into Penn Station and distributed food, toiletries and clothing. In the train station, we met a man who had a bandage over his eye, was wearing dirty clothes and a thin jacket. 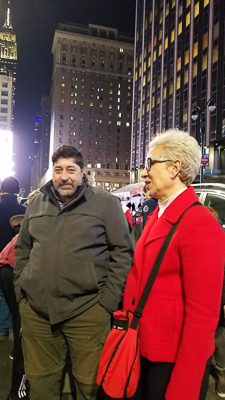 He asked us where we were from and when we told him a Greek Orthodox church, he said he had always wanted to understand more about the Orthodox faith. Deacon Simon had an engaging conversation with the man and was impressed with his knowledge of religion. As we were packing up and just about to leave, we noticed a man, Jose, settling in for the night on steps nearby. Jose had a grocery cart with a few personal belongings in them and a small blanket that he was pulling over him. 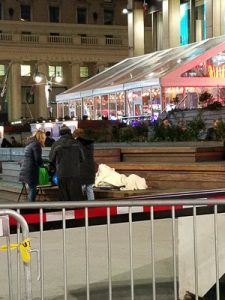 We see many homeless on the soup run and throughout New York City who sleep on the street but it really struck us to see this man getting ready to spend a cold and breezy night outside. Racing back to our cars, we searched for any remaining blankets. Miraculously, there was one large afghan in a car. We put it on Jose and gave him a hat, scarf, gloves and toiletries. He thanked us. 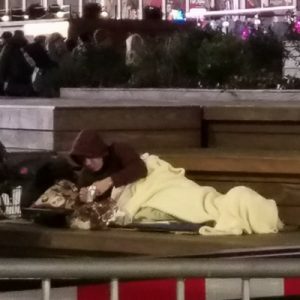 We were amazed that we had one last blanket to provide. 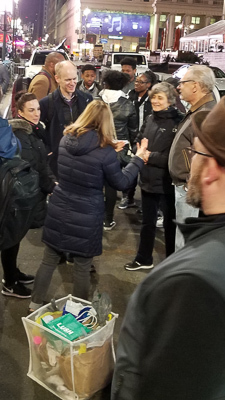 Our final amazing experience last night happened on the subway as one of our volunteers was distributing a few meals. After giving a meal to a woman, she handed him a note that said: “You are precious in God’s eyes”. 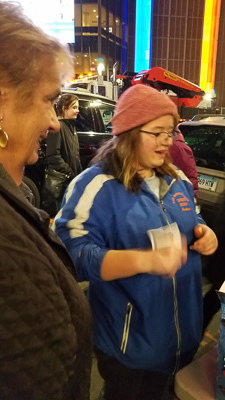 The soup run is a demonstration of love, compassion and commitment from the many volunteers and supporters who come together every month to share their time, talent and treasures. Our volunteers go above and beyond and last night was no different. 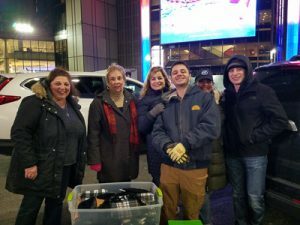 One volunteer chose to spend her birthday serving the homeless instead of attending a celebratory dinner and another volunteer delivered bags of clothing even though it was the day after her father passed away.